Bougatsa – Greek Curd Cheese Cake – Μπουγάτσα » Preparation, Bougatsa, Take, Greek, Philadelphia, beIt » tobias cooks! The Bougatsa has great similarities with what the Austrians call “Topfenstrudel”. This cake you get to buy in bakeries but you sometimes get it as well served in taverns. For sure you can find it in the Zacharoplasteio – the Greek confectioner. It is a very traditional Greek sweet that you will find throughout the year. Preheat the oven to 190 degrees centegrade. For the filling put the milk, the sugar and the starch into a pot and mix it gently while slowly heating it up. The mixture will form a thick cream. Take it off the stove. Mix the curd cheese, the Philadelphia and the butter into the cream. Spread some butter into the baking form and lay half of the puff pastry out into the form.Half of the pastry lays in the form and the other half remains to close the form once the cream was filled into it. Fill the cream into the baking form with the pastry and even the mixture out. Close the baking form with the remaining pastry. Cut the pastry and filling carefully in square pieces. Then put the baking form into the oven and bake for 30-40 minutes, according to how crusty you want it to be.It shouldn´t be too crusty, though. Take out of the oven, sprinkle the icing sugar on top. Ready! TIP: In some parts of Greece, the bougatsa piece is opened and the icing sugar is springled inside along with some cinnamon powder.It´s up to you! bougatsa with Philadelphia and curd cheese? 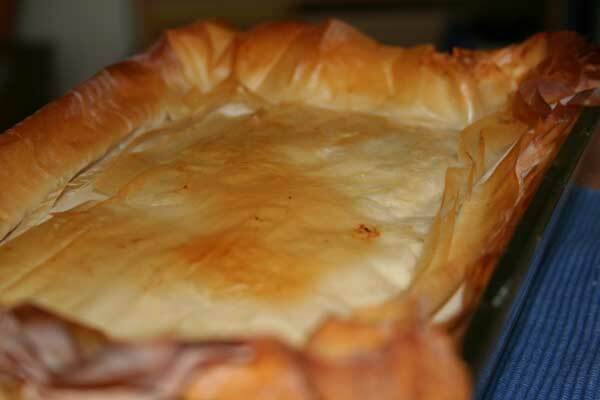 If you want original bougatsa taste use mizithra, feta. You have to take in account that most readers do not have acess to the mizithra. A Bougatsa with Anthtyro is well within the realm of possibility too. Once you try my recipe you will see that it is pretty close. Log in | 73 queries. 0.500 seconds.